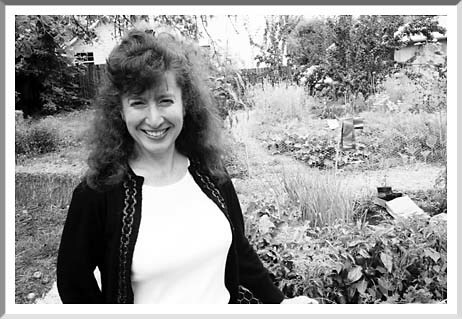 After growing up on a Hood River orchard, Mary Ellen Bennett came to the UO for a degree in Community Health Education. She stayed on in Eugene and currently coordinates a variety of energy-assistance programs for Lane County's Human Services Commission. A couple of years ago, Bennett purchased an empty lot directly behind her house, a few blocks from downtown Eugene. "I didn't want to see it developed," she explains. "Then I thought, 'Now, what do I do?' I hardly keep up with the dandelions in front!" Bennett approached her neighbors with the idea of starting a community garden. "We had talked about it before, like, 'what if . . . '" she says. "I was amazed -- easily 20 people pitched in." Neighbors from two blocks around showed up for work parties to remove blackberries and till the soil. Hoses, implements, and hay bales were donated, and the first garden was planted in the summer of 2003. This year's garden has 10 vegetable plots plus a communal flower garden. "I have berry patches available to everyone," Bennett says. "But I'm not in charge. They do all the work -- it's a symbiotic relationship."